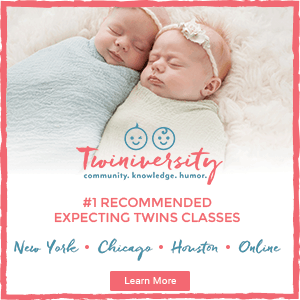 Nat shares her 5 reasons why swaddling helps in a Facebook live chat, sponsored by Love to Dream, creators of the Swaddle UP, which really is a must-have for twins. If you don’t have time or the ability to watch the video, check out our quick synopsis below the video. Most parents agree that swaddling is the right thing to do, but they actually don’t know why it’s the right thing to do. 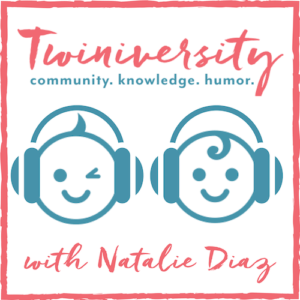 Let’s talk about why swaddling is an effective technique and why you should do this for your babies. The number one reason that swaddling helps (these are actually proven techniques), is because it really helps regulate your newborn’s body temperature. If there was a baby instruction manual that hospitals handed out to new parents, one of the first things that it would say is that it is four times harder for babies to regulate their body temperature. Babies have their body temperature regulated so much in utero that when they are born it takes their body a little bit of time to figure out what this whole oxygen situation is all about. A typical full-term newborn weighing between seven to nine pounds (all nice and fluffy) has a hard time regulating their body temperature, but a premature baby or a low birth weight baby has a significantly harder time because they don’t have all that fat storage. You really need to be a lot more conscious of your swaddling situation if you have a premature or a low birth weight baby. I remember that my babies were always dressed warmly in the NICU. Swaddling adds a layer of warmth to your baby. If you’re not sure of how much warmth your baby actually needs, it is recommended that your baby should be wearing one more layer of clothing than you are wearing. I’m wearing a 3/4 sleeve shirt, but my babies are wearing long sleeves and long pants. You should follow this way of thinking for the first three months. Everybody worries about space and square footage but they don’t always consider the climate of where you are. People that live in warmer climates sometimes think they don’t need to worry about keeping their babies warm, but regardless of where you live around the country you really do need to be focusing on the warmth of your babies. The second reason why swaddling is helpful is because of the Moro Reflex. What is Moro Reflex and what causes it? If you’ve ever been watching a baby sleeping and then all of a sudden they raise their hands and jerk a little bit, this is Moro Reflex. What happens is that there is this little alarm inside your baby and it goes off to certain things. It’s not just their arms, it can be their little legs crunching up super fast or they may even raise their head and let out a little gasp. The most common cause is a loud noise. It doesn’t have to be a door slamming, it could be an adorable dog barking, a siren outside, you dropping a mug in the kitchen or any kind of abrupt loud noise will often trigger Moro Reflex. Touching the baby suddenly and, interestingly enough, a change of altitude can also cause Moro Reflex. When putting your baby in their crib, pack and play or bouncy seat, sometimes this raising and lowering will trigger Moro Reflex. Swaddling your babies gives them the opportunity to kind of stifle the Moro Reflex so that they don’t end up jerking and hitting their arm on the side of the crib or even hitting themselves in the face while sleeping. If you have a child that is more susceptible to Moro Reflex, your pediatrician will always recommend swaddling. The third reason why swaddling helps, is that it makes your baby feel more secure like when your baby was in utero. Swaddling blankets mimic touch and it gives them that sense of security that they felt in utero. The fourth reason to swaddle, is it reduces crying. When babies are in their beds without a swaddle, they do tend to cry more because all of those other factors we’ve talked about come into play: they are too cold, their arms are jerking from Moro Reflex or they don’t feel secure. Swaddling definitely reduces crying. The fifth reason is a silly one, but if your babies are in a swaddle it will reduce the risk of them scratching themselves. Swaddling helps you set the stage for the ideal sleep conditions. There are five ideal sleep conditions: temperature, dark room, white noise, nothing in the crib, and a good swaddle. should be the maximum temperature of our child’s room. You never want the room to be too warm because then you’ll run the risk of overheating your baby which increases the risk of SIDS. For the first few weeks of your baby’s life, they do not have the physiological development to know we sleep at night and wake during the day. This is something that develops over time but you can assist them and expedite the process by putting your baby to sleep in a dark room. Invest in blackout shades, or you can actually just drape a black towel over their window. Darkness equals sleep. When babies come home from the hospital, silence is often jarring. They’re not used to having silence. While in utero, babies hear your blood flow, the movement of the amniotic fluid, your heartbeat and your voice. It is so noisy in there that when the babies come home and you put them into their crib it’s often alarming to them that it’s so quiet. We always recommend you get a white noise machine. No need to run out and buy a white noise machine from Brookstone, it can be a white noise app on an iPod, a humidifier, air conditioner or fan, really anything that is going to give off a consistent sound. No blankets, pillows, or stuffed animals in their crib. It is okay for twins to co-sleep, but absolutely nothing else should be in the crib. Swaddling regulates your baby’s temperature, gives them a sense of security and helps against Moro Reflex. Which leads us to the importance of swaddling correctly. If your babies are not swaddled correctly and you lock up their legs too tight, it can actually interfere with the way their tissues and muscles grow which can cause a higher incidence of hip dysplasia. Using a swaddle blanket like Love to Dream takes all the guesswork out of it. These blankets have a little bit more room for babies to freely move their legs and the unique “arms up” design replicates your baby’s behavior in the womb, unlike traditional swaddle blankets that keep your baby’s arms by their side or across their chest. There are a lot of things that you have to worry about, swaddling really shouldn’t be one of them! When will I know when to stop swaddling? This is a very subjective topic. It really depends on your babies. Some babies love to be swaddled for as long as possible and some babies hate to be swaddled from the beginning. Because of their gestational age, some babies may need to be swaddled a little bit longer. The American Academy of Pediatrics recommends that babies are swaddled until two or three months old. However, that is a big variable because it would depend on your twins gestational age. I would say ideally between two and four months. When your baby is ready to transition, Love to Dream has swaddling blankets that grow with your baby. The Love to Dream 50/50 assists with the transition because of their removable wing design. When you do the transition from a traditional swaddle to an arms-out swaddle, you want to do it slowly. This 50/50 design allows you to simply zip off one wing allowing one arm to be free and other swaddled. A few nights later, zip off the other wing allowing both arms to be free. You may want to transition one baby at a time. Often, as twin parents, we feel like if one child is doing something, then the other child should do it, too. This is not at all true. If baby A is sleeping contently in their swaddle, do not rock the boat. But if baby B is freaking out, then start the transition and leave baby A in a swaddle. When your baby starts to roll over, you may consider that being a sign to start transitioning out of a swaddle. This is one of the best things about the Love to Dream arms UP design. Your baby still has use of their arms, so if they do roll over, your baby can actually use their arms to roll back over or to push their body up allowing them to turn their head. 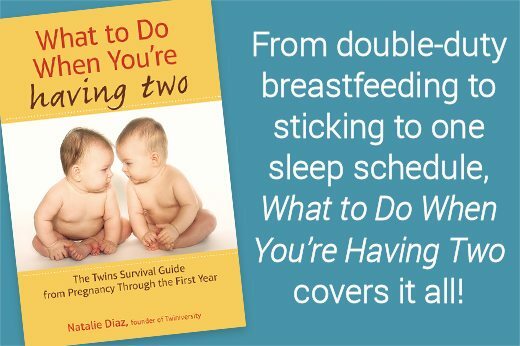 There are so many guidelines when it comes to babies, like how long to breastfeed, when to start sleep training, and how long to swaddle. Honestly, none of that actually matters until you are comfortable. By no means do you ever have to say, “Oh my gosh my babies are two months old, I have to get them out of a swaddle.” You do it when you feel the time is right and if you’re not sure if the time is right for your babies, then have a conversation with your pediatrician.